After a last summer dish, here is the carrots time... To celebrate this fact, I had to prepare a flan! But among all the flans I did, this one is not my favourite (although I really like the flashy colors on the photo!!). 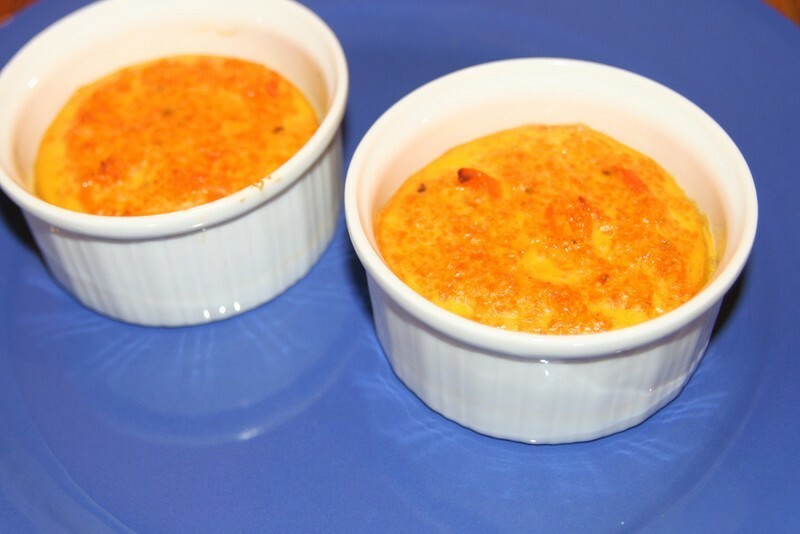 Because carrot taste is too tough but as Mercotte says flans are playful dishes to make children (and husbands) to eat vegetables !!! Preheat the oven to 180°C. Put a container filled with water in the oven (there must be around 2 to 3 cm of water in the container) in order to prepare the simmering pot ("bain-marie" in french). You can also boil some water just before putting the flans in the oven, the main thing is to be sure water is hot when baking. Wash and peel the carrots. Slice them. Cook them in steam during 5 to 10 minutes so that you can enter a knife very easily at the end of the cookin. Mix with a potato masher. Add eggs and light cream you beat before. Toos. Add some salt, pepper and some grated nutmeg. Pour in small ramequins and Verser dans des petits ramequins et bake in the simmering pot during pendant 25 minutes. 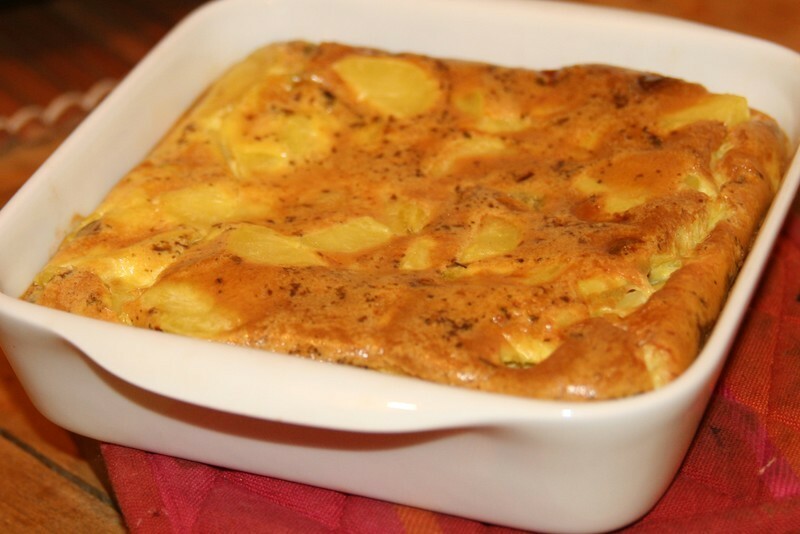 Peel potatoes, rince them and cut them in er les pommes de terre, les laver et les couper in 1/2 cm thick slices. Peel onions (or shallots) and mince them finely. Hot the olive oil in a big saucepan and make the potatoes golden and add onions. Stir 3 minutes and take off the fire. Drain potatoes and onions in a strainer. For a lighter version : bak potatoes 10 minutes in boiling salted water and cook onions slightly in olive oil. It is what I did and I do think it is already very good, and I didn't get a greasy strainer I would have to clean ! In a bowl, whip eggs in omelet with salt, pepper and with some nutmeg if you want (it is not obliged!). Add potatoes and onions and stir. Preheat oven to 180°C. Pour eggs in a pan (5 cm high). A porcelaine pan can be used too. Put it in the oven and bake during 30 minutes until tortilla is golden : if it begins to brown, it may be a little too cooked ... but I have to admid dosage is difficult ! It must be a dish you succed with expérience but after the succes it has with male race, I think I will make it often, when fridge is empty or when I am not feeling forward to cooking ! Taste it tepif ot at ambient temperature . 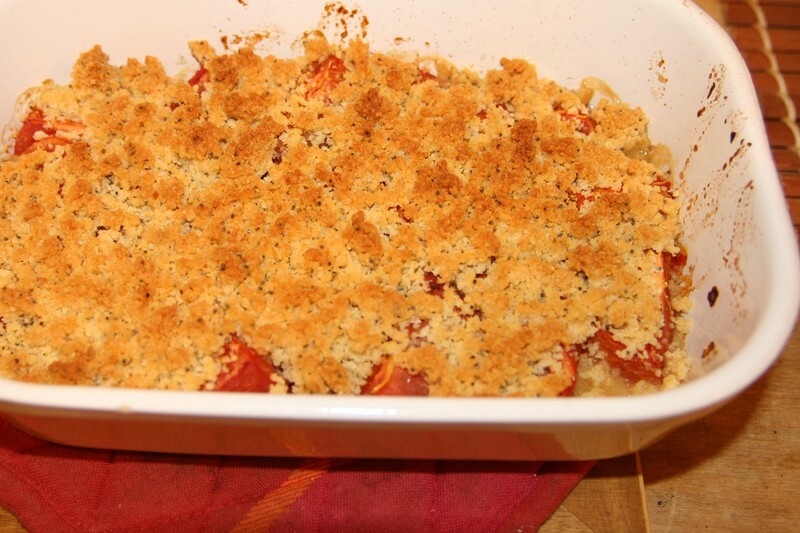 Comparing to my last crumble, I think I prefer this one because boscotti lighten the structure. Preheat the oven with th.4 (120°C). Rince the tomatos and plunge then one minute in boiling water. Before skins begins to tear away, I still feel one good minute occurs! Frain off the tomatoes, freshen them up under chilled water. Peel them and cut them in four. Lay out tomatoes pieces inside. Salt and pepper, sprinkle with grated mushrooms. Spray with some oil and put in the oven. Bake during 30 min. Meanwhile, prepare the paste : mix flour with parmesan cheese, biscotti and butter in fragments to get a granular paste. Take off the plate from the oven and increase the thermostat to 210°C. Cover up tomatoes with the paste. Spary with some oil and put again in the oven. Bake 30 min. Serve. Once again, here is a test Damien missed... Well, I mean he was not there to taste it, don't be mistaken ! But we liked it and if by chance we buy pineapples, he will be eligible for it. 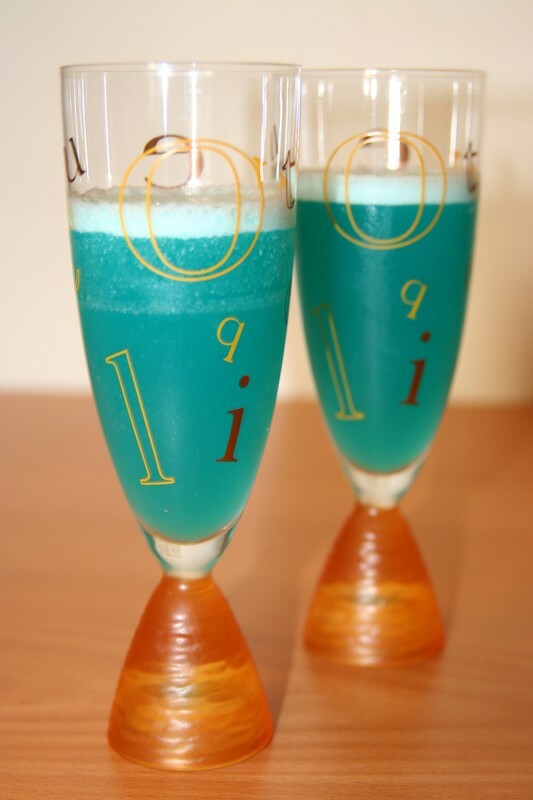 I like the intense color of this cocktail and its very soft taste despite appearances ! Here is a recipe I found on cuisine.tv. I was very interested by the association of thyme and classic biscuit and I wanted to try. As usual I divided quantities by 3 (I only want to test, and so I don't want to wait 6 months before we eat them all before cooking another cake ;)). I copy over the recipe and I give you my comments just after ! If you do the batter manually, you first have to work the butter to make it very soft, otherwise keep it just so. In a bowl, work egg yolks and sugar until the mixture blanches. Add leaves of thyme, butter, and the flour. Knead quickly, make a ball and put it down 30 minutes in the fridge. Preheat oven with 180°C. Butter oven plate with 10 g of butter. Abase batter to 3 millimeter-thick (that is to tell spread it with a rolling pin). Cout out a dozen of circles with a small glass (a tequila glass style) and deposit them on the plate, spacing them since they are supposed to swell by cooking. Put in the middle of the oven, and bake barely 10 minutes. They must be just colored when you get them off the oven. Otherwise they are overdone. Get them from the plate rhight away to stop the cooking and avoid dessication. make cold on a grill. A I already indicated in the ingredients list, I didn't really feel the thyme. Either because it was dry and furthermore less aromatic and flavoring, either because I didn't add enough. But I had another issue regarding the batter. Indeed, when spreading it, I had some trouble : my batter tore and I had to spread it several times before getting pretty flowers! Moreover the biscuits became soft very fast, from the day after their cooking. My question is then : why, where does it come from ?Because it is the first time it happens ; with classic biscuits (that is to say without thyme), everything is fine. I thought it was because of the use of only egg yolks because of the butter quantity : I should realise a statistical analysis on these 2 elements because according to me, it'd be better to reduce butter quantity (100g) and use one entire egg and 1 egg yolk. But I will go on informing myself ! Here is a recipe my honey "asked" to me. Indeed, when reading Elle, his eyes fell on it and he seemed to be very interested. I said to myseld that it must be possible and embarked on it. I thought that the hardest would be to buy everything (and indeed, I didn't find the beans but as it isn't the main ingredient in the dish, I estimate it is not serious). In fact, preparation was rather tough as well. But I don't want to discouraged you from doing it!! I only had some issues with the rice cooking. 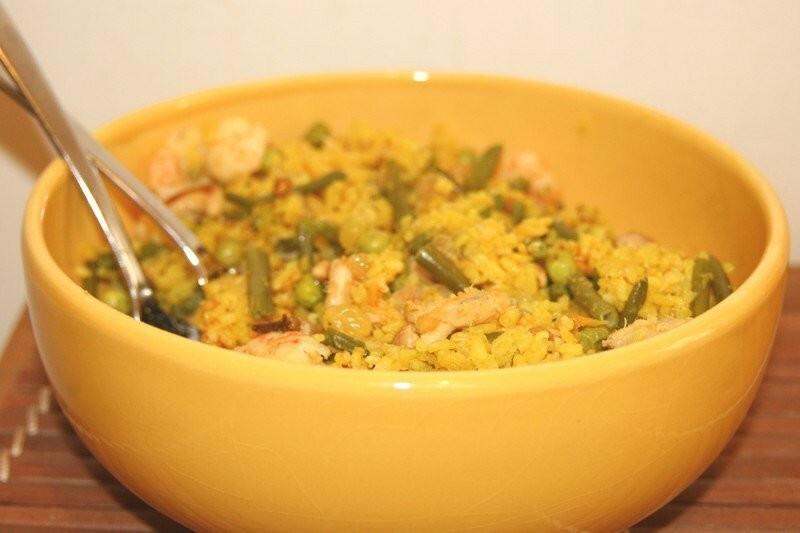 I had already tried to cook some curried rice (I couls add this dish in the questionnaire "Souvenirs d'enfance", I was fond of the one my mom did even if I didn't like onions in those days and I was spending 10 minutes at least to take them from the rice). From memory, I didn'never succeeded to make a good curried rice. And again, it was a failure since the rice was strange. Hopefully, as you will se in the recipe, my honey was there to support and help me. On the other hand, if rice doesn't have any secret for you, this dish is for you ! Shell green peas and beans. Plunge them 2 minutes in boiling water and peel them. If you don't have beans, you can put more green peas. Remove the stalk from French peas and cut them into 3. Blanch them minutes in salted boiling water. As a reminder, to blanch only means to throw them into boiling water and take them off after the lapse of time which was indicated. Peel and chop onions. Rince, dry and thin out coriander. Remove heads and tails of prawns. To do that, the easiest is to equip oneself with a pair of scissors : cut the head with the scissors and then insert a blade between the legs, under the skin and cut. After that, the tail comes off easily. Rince several times the rice until water gets limpid and strain it some moments. Heat sunflower oil in a large casserole with the spices (except one saffron dose). Add chopped onions and extend cooking on a moderate heat until they become translucid. Then pour rice and mix delicately with spicy oil and onions. Cover with 2 cm of water. Add vegetable and sultanas. Here, the recipe recommends to go on cooking on a slow heat and coverd. This is what I did and according to me, I did wrong ! Because my rice absorbed all the water and became an awful mixture. Hopefully my honey, who knows much in rice cooking ;) came to my help and together, we recovered the vegetable and cooked again some rice. To conclude, the approach would be : let the water evaporate and when all the water is away, cover and let cook on a slow heat. The rice will thus be steam-cooked. While rice is cooking, allow the prawns to marinate in olive oil, grater ginger and peeled and crushed garlic cloves, lime juice and Garam Massala. Mix the second saffron dose with some hot water (2 tablespoons are enough). Ten minutes before rice cooking ending, brwon the marinated prawns with the cashew nuts in olive oil, and stire delicately to the rice. Pour saffron infusion, add coriander and serve right away. To go with home made cocktails, I sometimes cook savoury muffins. It is also possible to cook them in rectangular pans, it is even classy to my mind. What is fun with this kind of aperitif biscuits is that you can finish off a lot of opened pots (of olives, tomatoes, ham...) : after all, it is easy to be creative. You can also use a savoury cake recipe and, instead of cooking it in a ordinary pan, right in the small cells ! Mix flour and baking powder. Add eggs one by one and mix between each addition. Pour out olive oil and milk. Mix. Add black olives in pieces and chopped tomatoes, then salt and pepper. Mix well. Pour the preparation in muffins pans. Bake around 15 minutes at 180 °C (th. 6). I had seen this recipe in Bon Appetit newsletter. Picture was attractive. And when I took action, I had some doubts (we will sen when reading the recipe!) but result is more than pleasant. 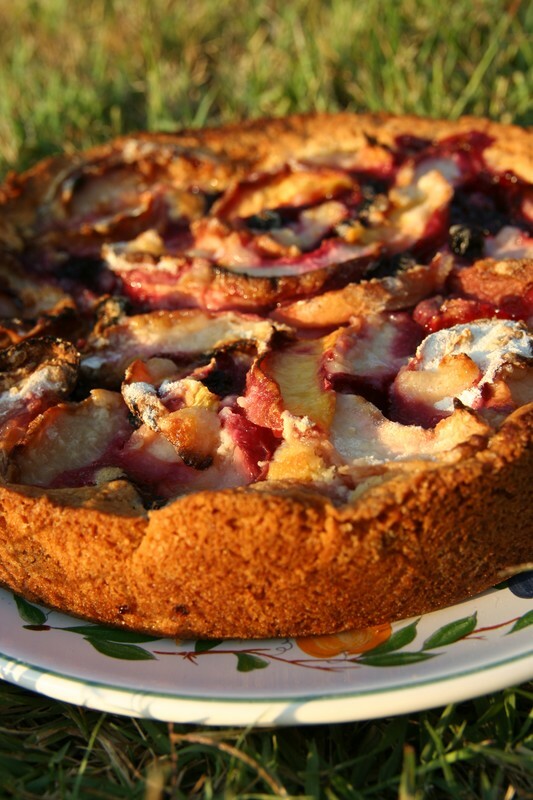 It is a cake which contains more fruits than crust and it stops you feeling guilty when you eat it! As the recipe tells, this cake bakes for a long time at a moderate temperature, which helps keep the ripe fruit from bursting and releasing its juices. Make pastry: Pulse together 1 1/2 cups flour, 1/2 cup sugar, baking powder, and salt in a food processor until combined. Add butter and pulse just until mixture resembles coarse meal with some small (roughly pea-size) butter lumps. Add egg and vanilla and pulse just until dough clumps and begins to form a ball, about 15 pulses. Press dough onto bottom and evenly (about 1/4 inch thick) all the way up side of springform pan with floured fingertips. Chill pastry in pan until firm, about 10 minutes. Make filling while pastry chills: Put oven rack in middle position and preheat oven to 375°F. Stir in a large bowl remaining sugar. Add peaches, blueberries, and lemon juice and gently toss to coat. Spoon filling into pastry and bake, loosely covered with a sheet of foil, until filling is bubbling in center and crust is golden, about 3/4 hours. Transfer cake in pan to a rack and cool, uncovered, 20 minutes, then carefully remove side of pan. Cool cake to barely warm or room temperature, then cut into thick wedges with a sharp knife before serving. Cooks' note: Pastry can be made and pressed into pan 1 day ahead and chilled, wrapped well in plastic wrap. Remove from the refrigerator 30 minutes before filling. My honey goes on with his tests of coktails. Now his trend is easy cocktails (we are in summer and too rich cocktails are not necessarily recommanded). So besides "Floc de Gascogne", that is a speciality of Gascogne as its name shows ! another cocktail goes with our sunny evenings : raspberry vodka. I like the little chap : he seems to tell we did something silly but that's so good! Pour some vodka in a glass, complete with raspberry juice and then sip with a straw. Paris is deserted, and so food blogosphere. Indeed a new questionnaire has appeared but it seems to me that a few of us answered it. I thank Frédérique for asking me to answer it.